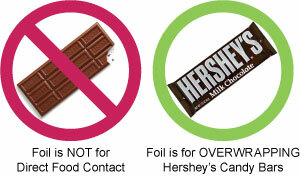 All foil colors are paper backed foil and very easy to wrap the new style Hersheys Milk Chocolate or Nestle Crunch candy bars. So glad they sell individual foil wrappers! Great quality and choice of colors with video instructions for do-it-yourselfers. Very quick shipment. This is definitely a good place to order supplies. I needed these black foil wrapper to help with my promotional items. The wrappers had a high quality thickness to them and it added a touch of elegance. Not to mention the shipping was pretty fast. Exactly as advertised. Quick delivery. Will definitely order from them again! Very easy to fold, highly recommend.